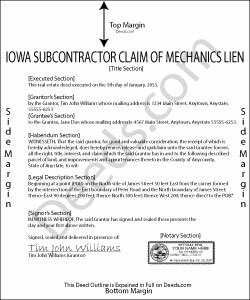 Under 572.10 of Iowa Code, subcontractors are eligible to claim a mechanic's lien. A contractor or a subcontractor may perfect a mechanic's lien beyond ninety (90) days after the date on which the last of the material was furnished or the last of the labor was performed by filing a claim with the clerk of the district court. I.C. 572.10. A valid claim identifies the parties, the project's location, relevant dates, a list of work and associated charges, any payments, and the amount due. The claimant must provide written notice of such claim to the owner. Id. The notice may be served by any person in the same manner that original notices are required to be served, such as personal service or certified mail. Id. If the party to be served is outside of the county where the property is situated, a return of that fact by the person charged with making such service shall constitute sufficient service from and after the time it was filed with the clerk of the district court. Id. Kimberly R. said: Very easy to use. Very informative. I think this is a very good service and is worth the $19 especially if you value time.